Brianna and her team recently fought their way to an undefeated season of 10-0. 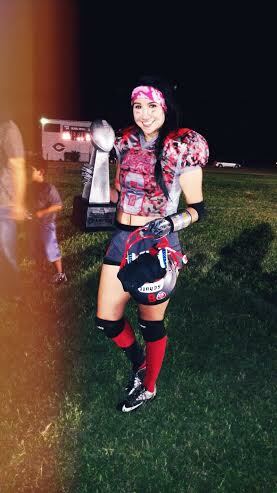 As starting receiver, Briana not only helped her team to their championship win, but she contributed to a 100-point game, which made Texas Legacy the first semi-pro ladies team in history to score 100 points in a single game. “I’ve always played sports throughout my life, so I wanted to do something more challenging. I was somewhat familiar with the game because I was a cheerleader for four years but never knew much about the technical terms,” said Brianna about getting involved with Texas Legacy Football. In her free time, Brianna likes to workout, go out with friends, dance and sleep.